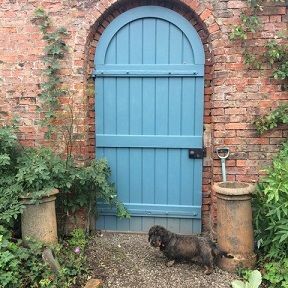 The Stable Gallery at Old Sleningford is set in a beautiful and rural part of North Yorkshire, five miles north of Ripon. Art courses are held throughout the year in the converted 18th century stables. Our courses are run purely for the benefit of a charity which supports The Leith School of Art, founded by Lottie and Mark Cheverton. There is an excellent and well equipped studio for indoor work and an abundance of outdoor spaces. Classes are kept small enough to ensure comfortable working conditions and full scope for individual attention. The garden has many features which make it an inspiring place to paint. There is an old mill, a lake with islands, woodland, a walled kitchen garden, herbaceous borders, summer houses and also old farm buildings nearby. All this provides a rich variety of subjects for the artist. The gardens will be open for The National Garden Scheme in 2019 on 1st and 2nd of June. 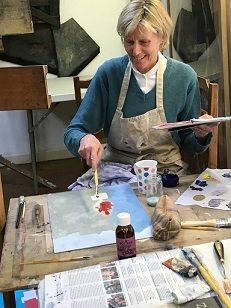 As well as the courses listed, there is a Life Class every Friday, a Drawing and Painting Class every Tuesday and due to demand a new Drawing and Painting Class on Thursday. These all run for three 10-week terms from September to July and further details can be found on the Weekly Classes page. 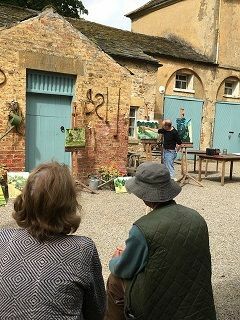 A range of courses are also held at Old Sleningford Farm, which include Basket Making, Sausage Making, Willow Chair Making, Pig Keeping and Food from the Hedgerows. Please see www.oldsleningford.co.uk for full details.